A couple turns an old barn into a luxurious house, but wait until you see the kitchen! The great success of mini-houses and maisonettes has inspired many people to renovate their old caravans. Others have chosen to build their main residence in a large container. 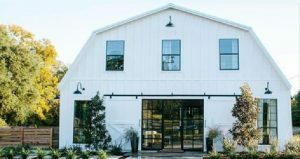 Now, a couple had a better idea, and it’s an old barn which has been completely renovated and turned into a luxurious home. Larger than cottages, the barn is 2,700 sq. Ft. (250m2) and, therefore, space is not restricted. The house actually has several rooms, including two bathrooms, a dining room, a living room and more than one bedroom. It is so spacious that it can accommodate up to 15 guests. If you had been offered to live in a barn, you would surely have rejected this idea from the start. But after your virtual visit, you will enjoy and dream of owning one identical to this one. So if you know someone who has an old abandoned barn, you may make an offer, and in return, you will make a house as sumptuous as this one. A single glance at the front of the house is enough to charm us. On each side of the entrance door, two large windows have been installed, providing maximum clarity and daylight. On the upper floor, three windows of the same size illuminate the rooms. 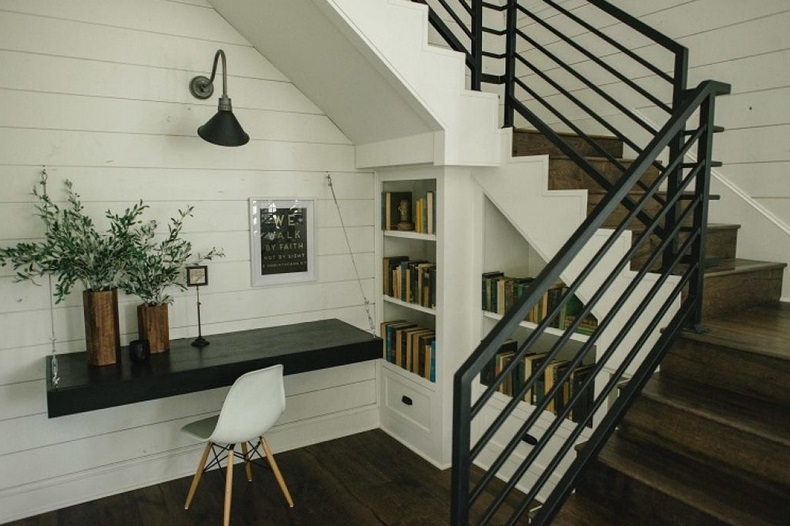 The back wall has a double door and a barn door, and a staircase leads to a small balcony. We also note that the outdoor lights are identical to those used previously to illuminate the barns. The house is large enough to contain a vestibule, and it is in this room that we find ourselves when we enter through the front door. In addition to the bay windows, a superb light also illuminates the place. 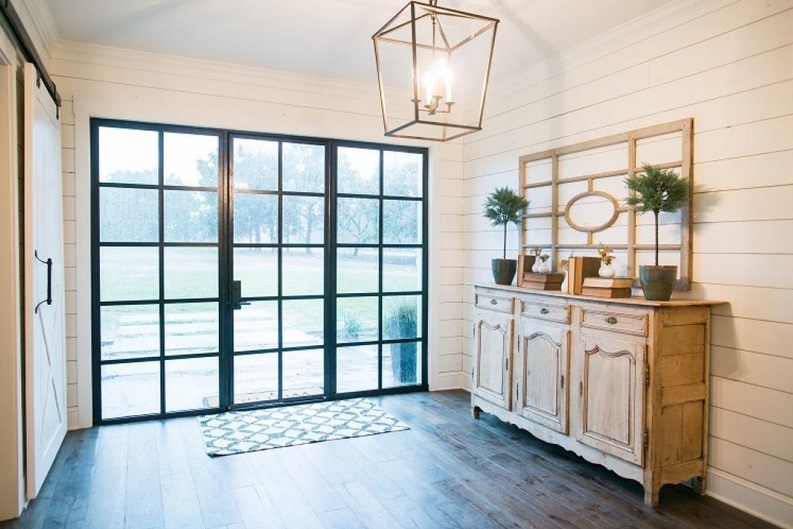 On one side, there is a sliding barn door and on the other side, a piece of antique furniture is leaning against the wall. Just above, we hung a frame made of very original wood. 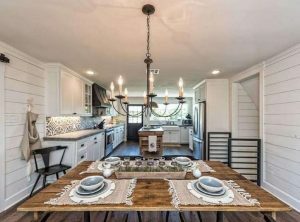 The large kitchen is fully functional and is equipped with normal size appliances. The three counters give the room all the necessary space for the preparation of meals. In this room, there is certainly no lack of storage since the cabinets, some of which are glazed, and the drawers are very numerous. 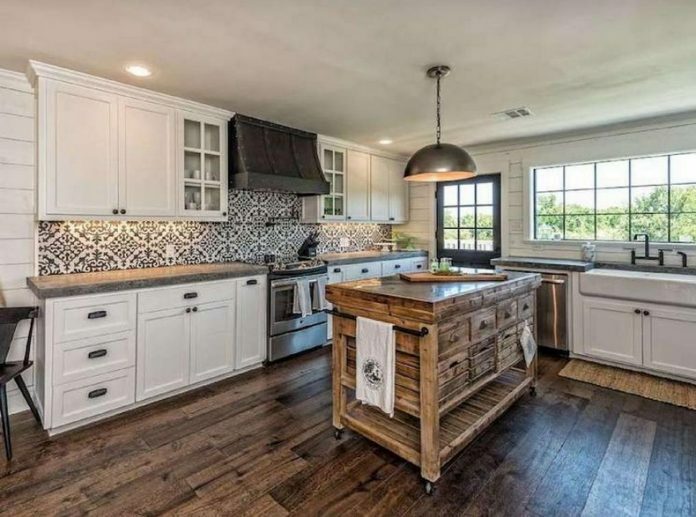 In the middle of the kitchen, an island made of wood greatly enhances the decor. A table, also in wood, allows a couple to eat their meals alone. 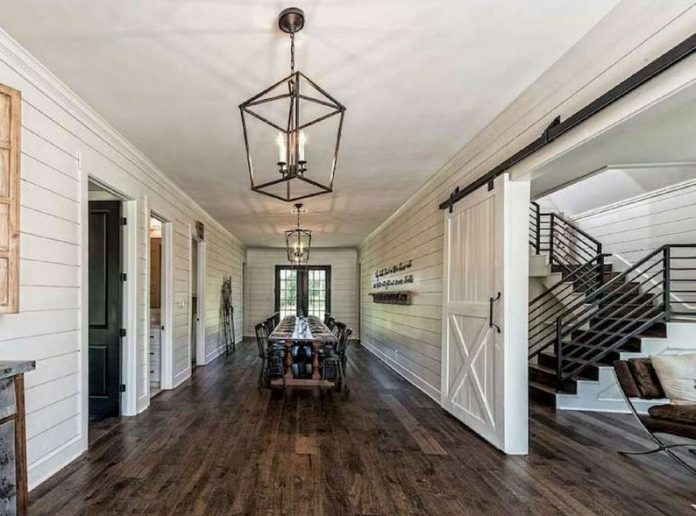 The people who have turned this barn into a home must surely like to receive many guests, as they have built a large dining room. It is mainly furnished by a large wooden table. 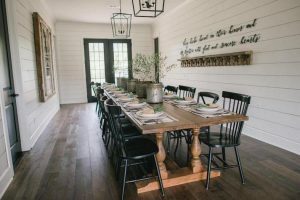 It can accommodate a dozen guests who sit on black chairs that are not all identical. On one of the walls, just above a shelf, we note the presence of a message, probably symbolic, which we can unfortunately not decipher. 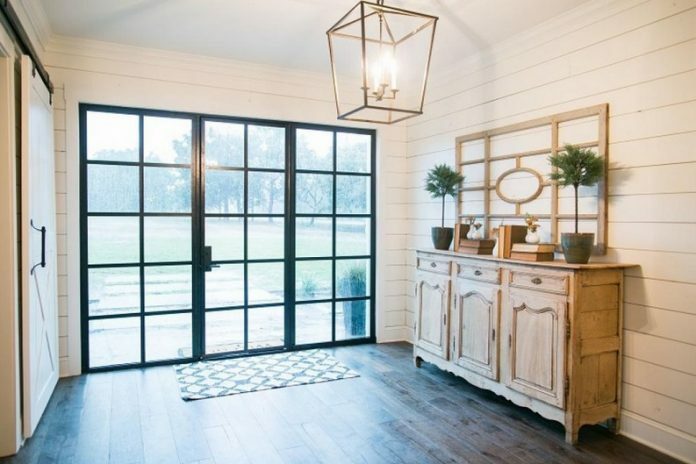 Two sliding barn doors, which can be closed for a little privacy, give access to the living room. It is well lit by two glass doors, two windows and a ceiling fan with light. You can relax on the three-seater leather sofa or on one of two chairs directly on the opposite side. Between the sofa and chairs, a coffee table was installed on a white carpet with black patterns. 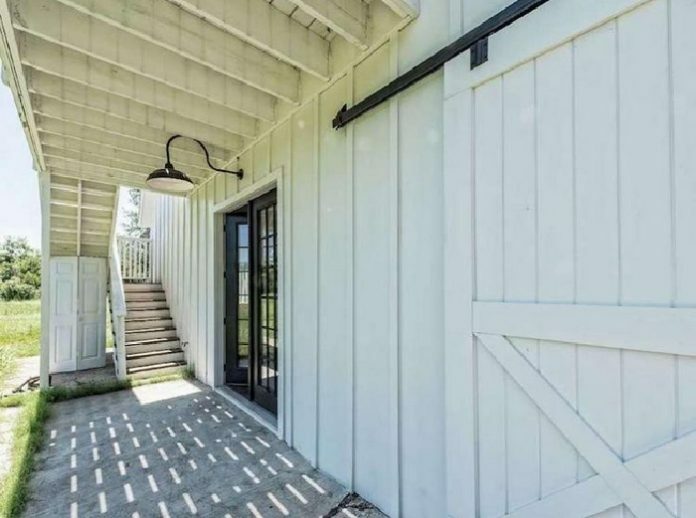 The barn being so large, the couple even allowed themselves to reserve a corner for a small office. The work surface was made from a black wooden board supported by chains. The only piece of furniture in this room is a small white chair that provides a nice contrast. Then, under the stairs leading to the second floor, there is a library where are stored several books. The bathroom on the first floor is smaller than the second floor bathroom. Although it is modern, it does not have anything to envy to the other, and you will understand why when you will see it. In addition to the toilet, it has a shower with a glass door. Above the counter, which supports a sink, a large mirror has been fixed. There is also a pharmacy near the ceiling. 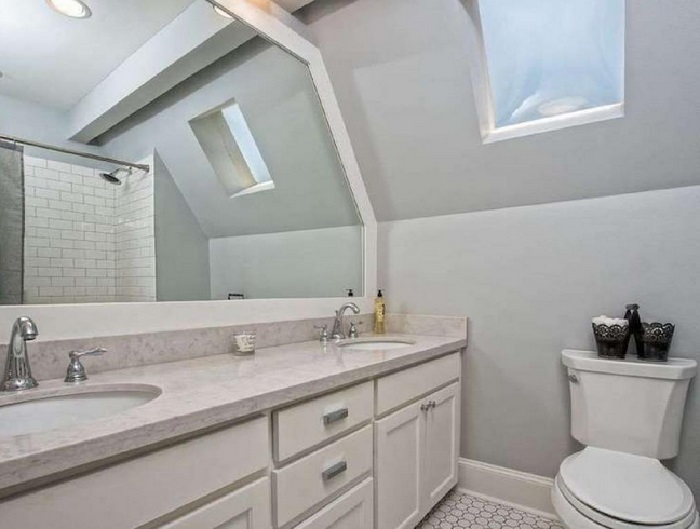 It seems like the owners were inspired by the luxury found in the largest hotels to fix the second floor bathroom and, if so, the result is perfectly successful. We note indeed the large counter that has two sinks. 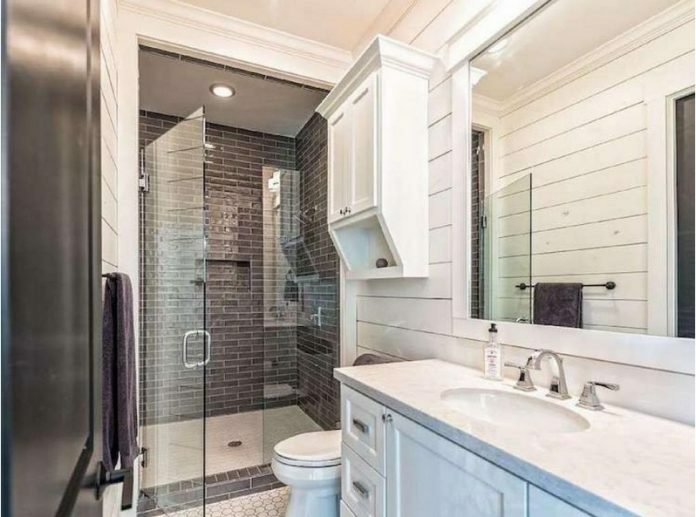 In addition to the toilet, there is also a shower. As for the mirror, it borrows the form of the ceiling; the room is lit by a window as well as ceiling lights. 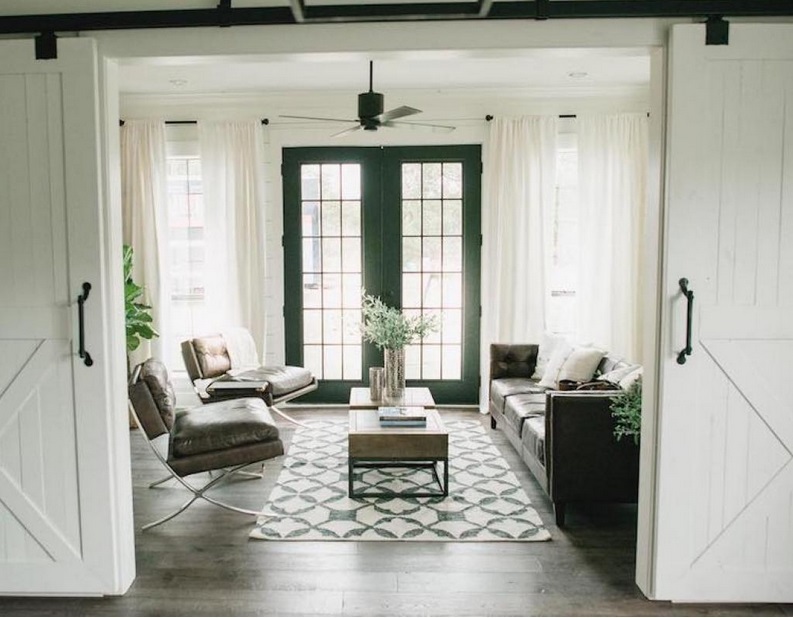 We did not expect it, but the house also has a beautiful living room. 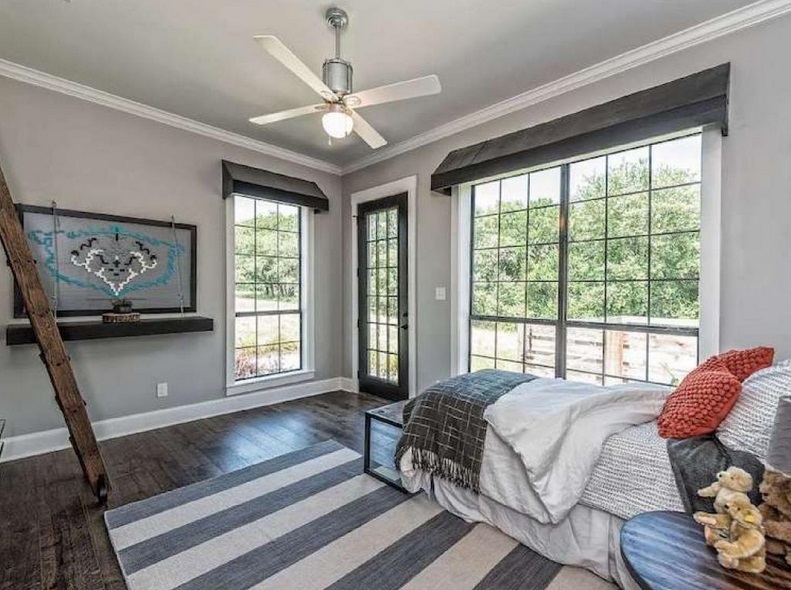 The room is lit by a glass door, a large window, a smaller one and a ceiling fan with light. In the single bed near the large window, you can rest, read or lounge for hours while admiring nature. A boy or a girl would feel lucky to spend only one night in this beautiful child’s room. 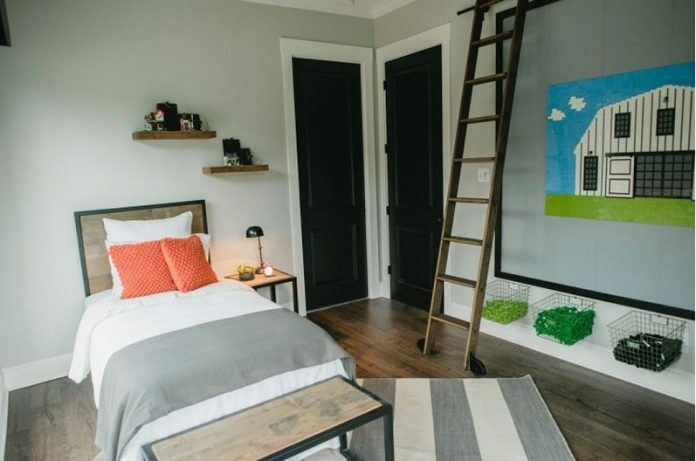 He or she would be able to sleep in a comfortable single bed, above which two shelves have been fixed. 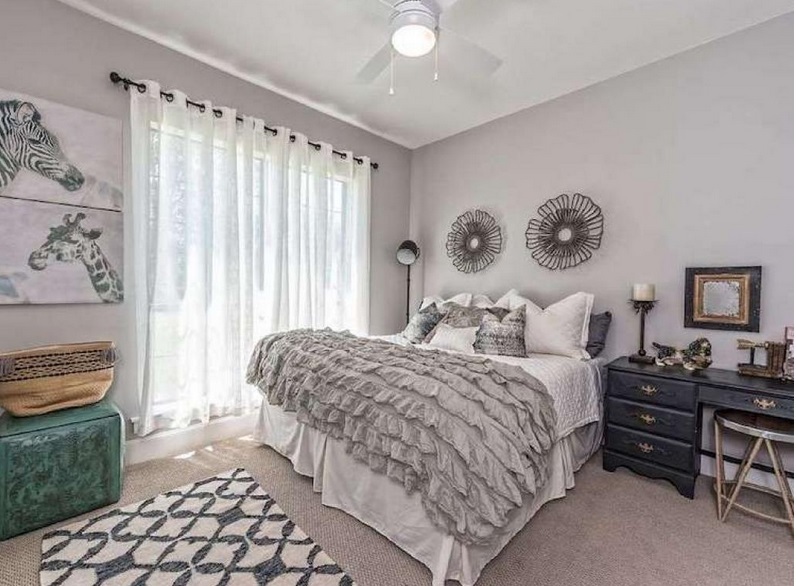 In addition to the bed, the bedroom also has a small bedside table and another table at the end of the bed, much like the one found in hospitals. On a wall, baskets are hung and they serve as storage for Lego blocks or other toys. The master bedroom is really beautiful: it is enhanced by the decoration and the luxury bedding. The bedspreads and cushions are so chic that one would be reluctant to undo the double bed. Of note, all the accessories were arranged with the color found on the walls. A small black table adds a nice decorative touch. The room has good lighting from large windows and a ceiling fan with light.